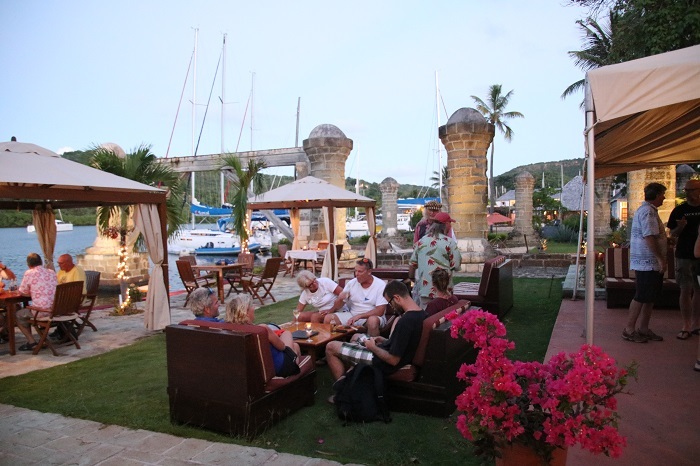 Come to Antigua and have a great time, Antigua style. Here I am, home again in CT, after a week in Antigua to welcome the Dawgs and The Salty Dawg Rally to the Caribbean. They had a tough slog on the way down, some saying that it was the most difficult run in nearly a decade. 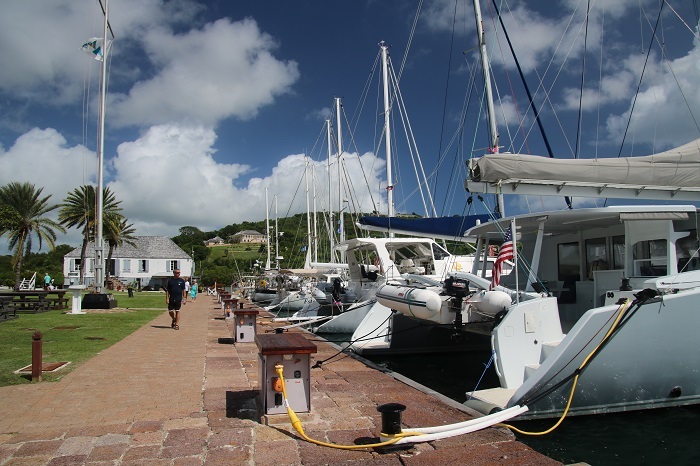 Faced with persistent SE winds, about 25 boats had to stop in Bermuda for fuel repairs or both. Others kept heading south, working hard to make their way against relentless headwinds. 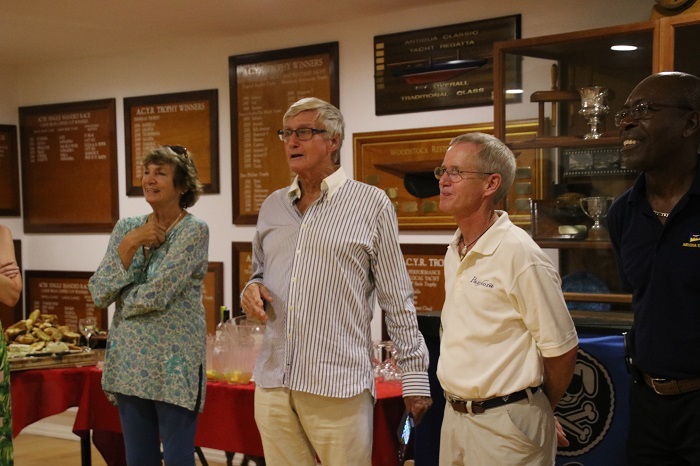 With the fleet about equally split between making landfall in the BVIs and Antigua, the expectation was that about 30-40 boats would end up in Antigua. 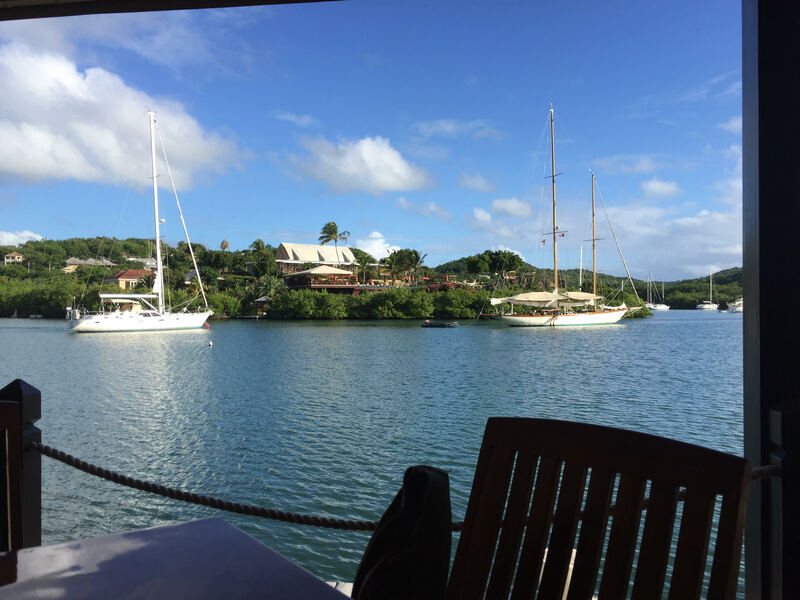 However, with some boats taking nearly 2 weeks to make the run from Hampton, VA, as they passed the BVIs, a number of Antigua bound boats, out of time, stopped there instead of continuing on to Antigua. I was bummed about that but certainly understand that crew has only a limited time to be away and with Thanksgiving early this year, schedules were tighter than usual. 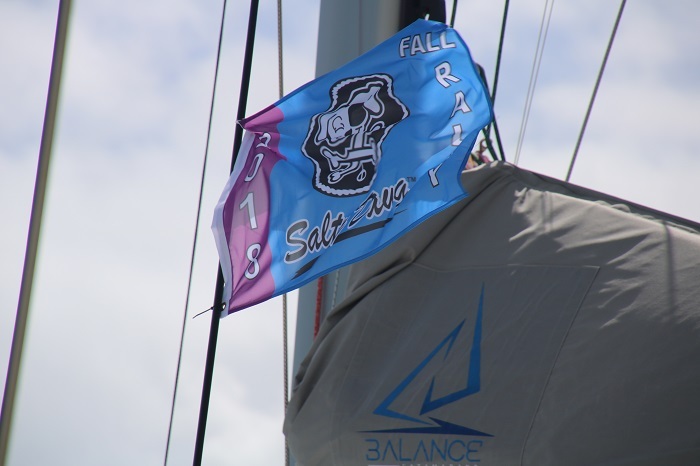 And, speaking of Thanksgiving, this year it was on November 22nd, but next year it will be nearly a week later, on the 28th, which will take a lot of pressure off of schedules for both skippers and crew. Anyway, when I arrived in Antigua on November 12th, there wasn’t a Dawg in sight excepting a few that had happily made their way north from Trinidad to meet up with the fleet. Unfortunately, with nobody in “town” I had to put off the first event. However, by the time our next event, on the 14th we had a respectable showing so we carried on. The plan was for the boats to congregate in Nelson’s Dockyard and a number of Dawgs did just that. It was nice to see our rally flag being proudly flown in such a historic spot. 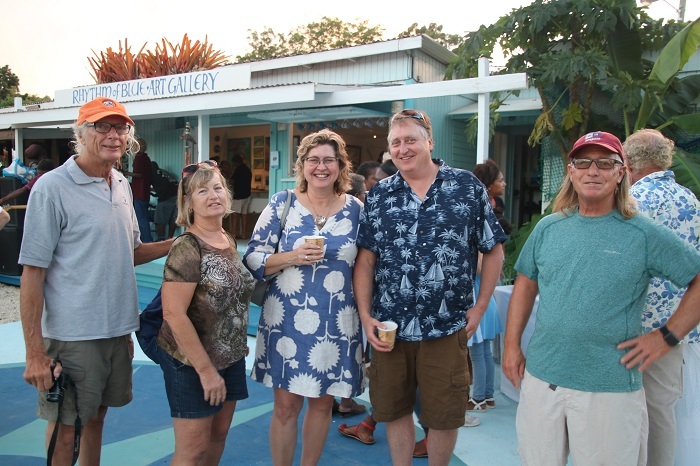 Our first event, held at Rhythm of Blue Art Gallery was a great way to kick off a week of celebration for skippers and crew. 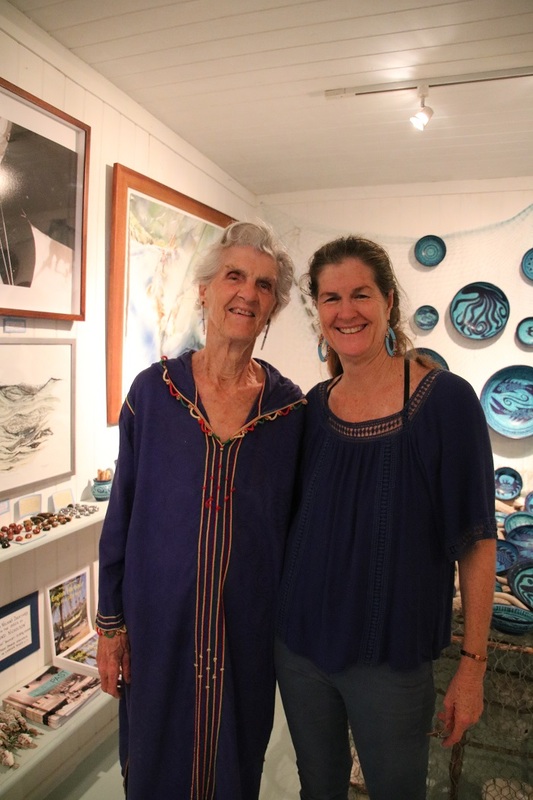 Nancy Nicholson, who owns this lovely gallery in English Harbor, timed her season opening to include us and it was a great evening, complete with a terrific reggae band, rum drinks and great sushi appetizers. I expect that Angie of Club Sushi, at the Yacht Club, had a hand in providing the sushi. I’m no expert but Angie does make great sushi. Nancy was joined by her mother, Lisa Nicholson at the opening. 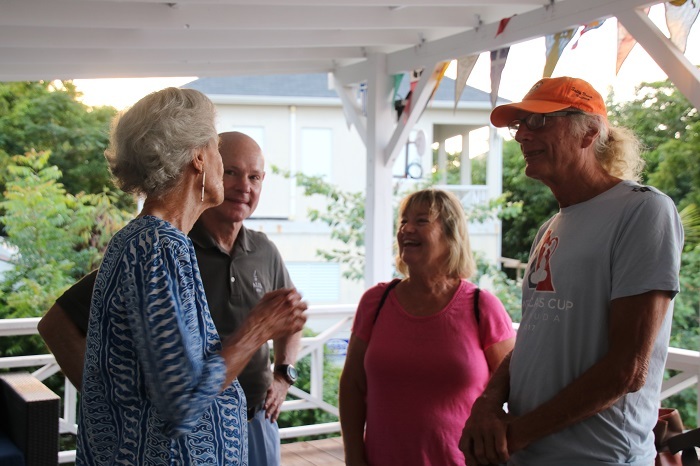 Lisa and her husband Desmond came to the island in the 50s and were instrumental in establishing the charter and tourism trades on the island. 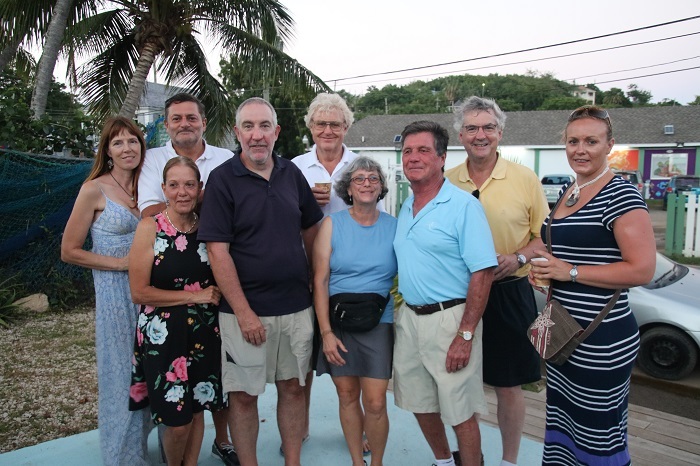 The Nicholson family had a lasting impact on Antigua. I have a book with photos that Nancy’s father Desmond took in the 50s and will be posting them soon. They are wonderful and show the remarkable transformation that the area has undergone over the decades. Nancy and her mom. Note Nancy’s colorful pottery behind them. True to form, Nancy brought in a great band. It was a lovely evening. A number of “early Dawgs” joined in the fun. But wait, more Dawgs. 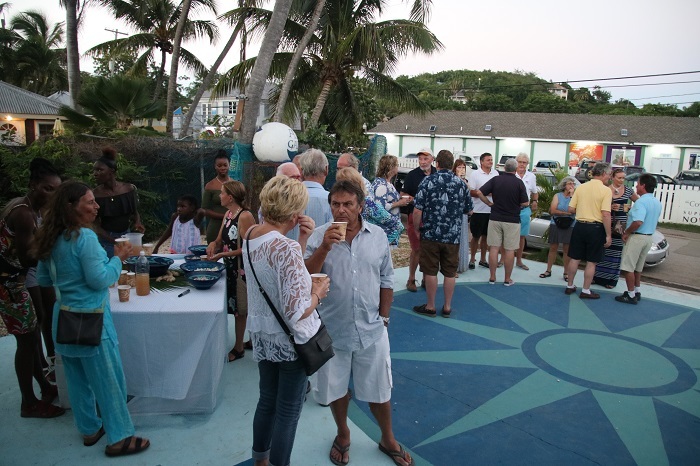 The ever generous Antigua Yacht Club hosted three events for us. Count em, three. That’s a really remarkable showing of how welcome the Dawgs are in Antigua. 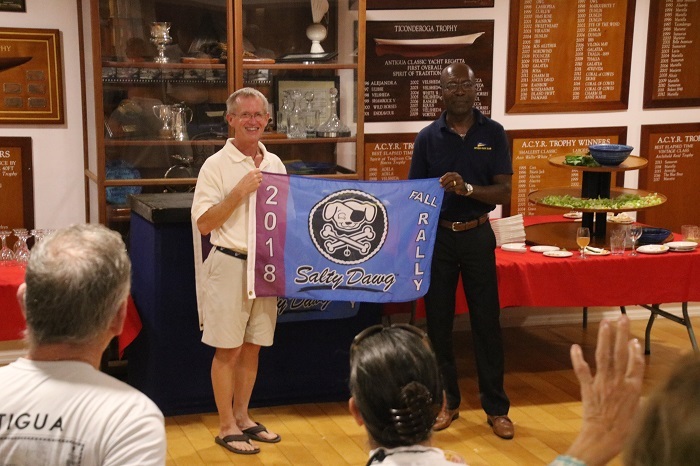 I presented a rally flag to AYC Commodore Franklyn Braithwaite. Franklyn has been tremendously supportive of our efforts to bring the rally to Antigua. 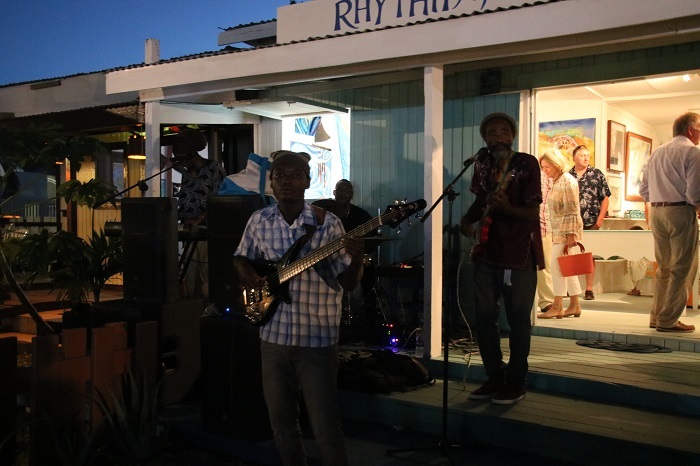 Franklyn is a fixture in Antigua and an accomplished Olympic sailor. I guess you could say that Franklyn is truly a “Dawg’s best friend”. And, speaking of the best friends, Janie and Geoffrey Easton, have worked tirelessly on our behalf with local businesses and government agencies to smooth the way in Antigua. Without their help, things would not have gone so perfectly. The clubhouse is a great spot to spend time with friends. 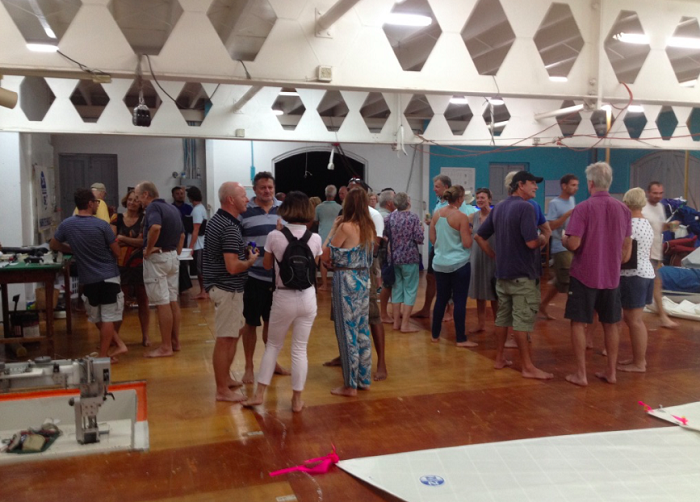 AYC even opened up the clubhouse for a “down island briefing” hosted by Bill of Kalunamoo to help the Dawgs learn about the best spots to visit between Antigua and Trinidad. 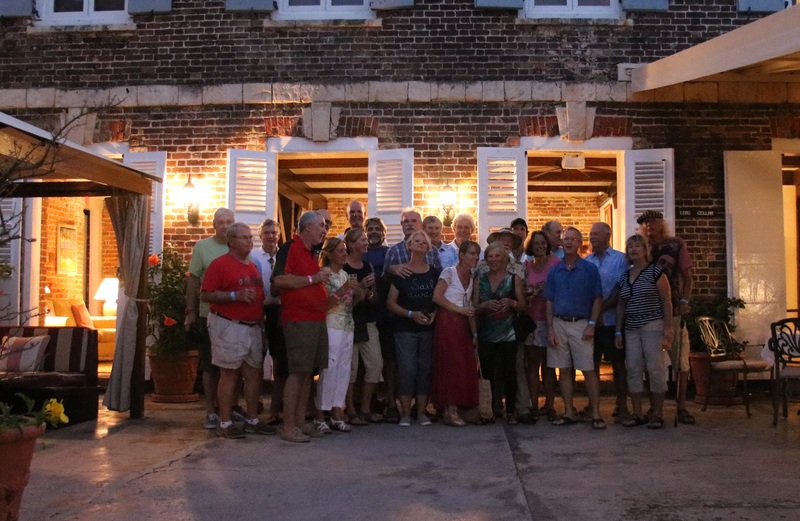 Bill and Maureen have explored the islands extensively over the last few year and were happy to share their experiences. 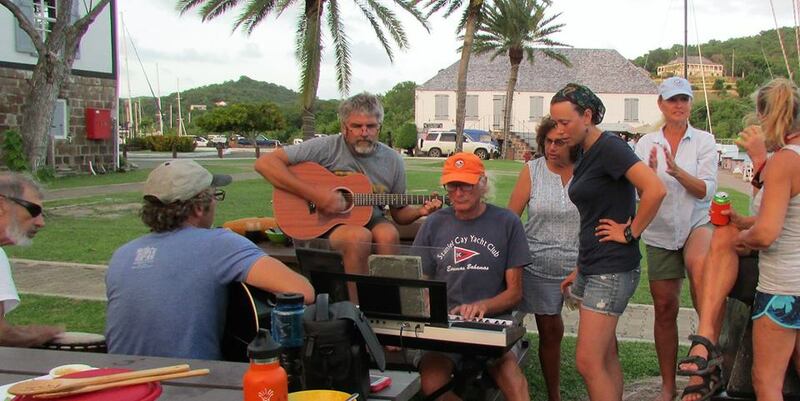 The Dawgs even took time out for a jam session in the Dockyard. Once again, the Royal Navy Tot Club of Antigua and Barbuda, regaled us with a “tot of our own”. This is a wonderful tradition of raising a glass to the Queen, yes that Queen, every evening at 18:00 to carry on the now discontinued British Navy tradition of issuing a “tot” of rum to it’s enlisted men. What wonderful historic surroundings of Copper and Lumber, in the Dockyard. The rum was good too. North Sails opened up their shop for a cocktail party, complete with crepes for all. I missed this event but heard it was a lot of fun. And, of course, our arrival cocktail party at the Admiral’s Inn, a wonderful spot to enjoy history, and an “adult beverage” in the heart of the Dockyard. 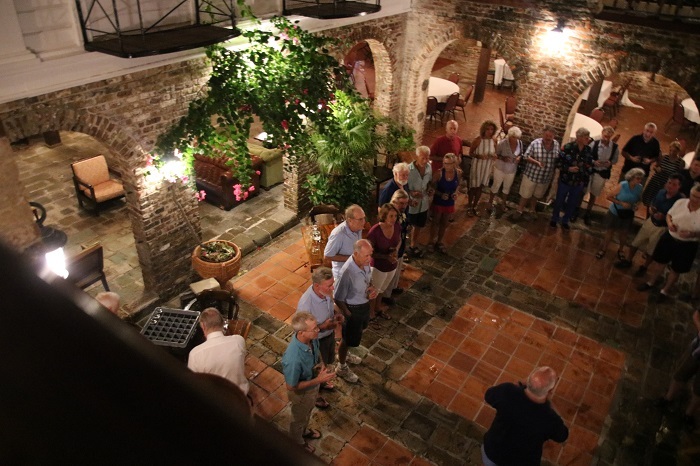 We also had our arrival dinner, the capstone of our week of celebration in Antigua, at the Inn. Happy Dawgs. Me, I was happy to stay at the Inn myself for a week and had some really tasty cups of coffee while enjoying the sights from the deck. Well, here I am, writing about all this and we are on the tail end of a cold snap with temperatures in the low teens. All I can say is that “it will be better by May”. Yes, and shortly after that Pandora will be back in the water. Something to look forward to. Antigua next November? Yes, indeed. I’ll be there. And, if you are too, you’ll have a great time, I guarantee it. In fact, plans are well underway and I’ll soon have details of what’s in store for our arrival by mid January. Arrival dinner? Sure, we got that. How about Celebratory Week, Antigua style? And what a great style it is. Oh yeah, come January you can click here to sign up and get more information about the 2019 Fall Rally to the Caribbean, you’ll be glad you did. Yay, new post! I really like the picture of you presenting the flag!